Dedicated people for your requirement. Well experienced software development team. Blend IT Solutions provides full Software development lifecycle services, including architecture, design, development, integration, implementation, customization and support. The end products that we deliver to our clients undergo intensive testing and are always subjected to a beta release before the final release. Software/System Requirement Specification: In this initial stage of SDLC, our project leads meet the clients for detailed discussion for functional and nonfunctional course, design, and platform requirements. Also known as feasibility session, this stage outlines the scope of project, purpose, interfacing, resources involved, required functions, schedules, cost, and deliverables. After complete guidelines are created, proposal agreement is signed. Software/System Requirement Analysis and Design: Our Project Managers and software developers analyze the accuracy and sufficiency of the requirement specified. Hardware and software architecture is designed developing a software module based on the design specification document. 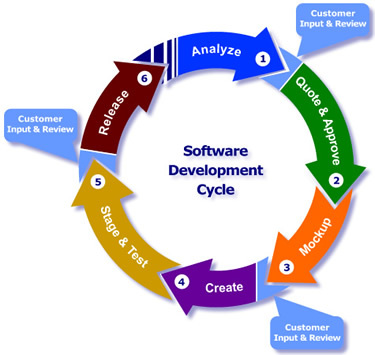 In short, the logical flow of the software product or service to be developed is created. Code Generation and Testing: Programmers write code according to the design specifications. They utilize the latest tools and technologies that are best fit for the software development and client approved. The prototype design is sent for client approval, after which development process starts. As the code is generated, automated or manual testing is done alongside, to release bug free modules at pre-decided milestones. Deployment, Training and Support: Successful deployment and complete training is provided to the end-users. Our support and maintenance services are available for changes during post implementation stage.